Nora Brugman was born and raised in Barcelona, Spain and has been sailing since the age of 4. She sailed and competed internationally in Optimist, 420’s, 470’s and 49erFX. She was 420 Spanish National Champion and qualified for the national team to sail in multiple World Championships, European Championships and the Youth ISAF Worlds in 2009 where she finished 6th. She graduated from the Universitat of Pompeu Fabra in Barcelona in 2016, where she majored in Advertising and Marketing. 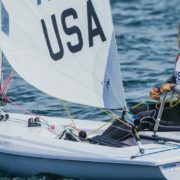 She combined her studies with Olympic Sailing and campaigned for the 2016 Rio Games, she started in the 49erFX class and then moved to the 470 class. She has coached Optis at her hometown Yacht Club and has been coaching the 420 Racing Team at Shelter Island Yacht Club for the last four seasons. During the 2016-2017 season, she was the head coach of the Optimist, High School, and 420 teams at P.Y.S.F. in Redwood City, CA. After getting a glimpse of Olympic sailing, Nora was sure she wanted to campaign for the Tokyo 2020 games with her sister Atlantic in the 470 class. On her free time, Nora loves to ski, travel, hike and spend time with her friends and family. Atlantic Brugman learned how to sail in Barcelona, Spain at the age of 5. As an Opti sailor, Atlantic became a French and multiple Spanish National Champion. During her time sailing 420s, she and Nora continued to earn National Championships, and compete in events all around the world. After graduating from high school, Atlantic took a year off to get her Ocean Yacht Master license from the United Kingdom Sailing Academy (Cowes, UK). She then moved to the United States and attended University at Connecticut College (New London, CT). While sailing for Connecticut College, she helped her team come in 2nd at the 2011 Women’s National Championship, finishing 2nd in A division. Atlantic was a two-time college All-American and was named Connecticut College female athlete of the year her senior year. After graduating from Connecticut College with a BA in International Relations, Atlantic spent a few years working in non-profits in Germany, the Dominican Republic, and Spain. For the last two years, Atlantic has been an assistant coach at Stanford University (Palo Alto, CA). She spent most of her time coaching the women’s team, leading them to a 5th place finish at the 2017 Women’s National Championship. 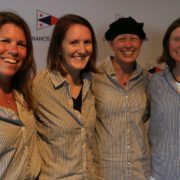 During her time at Stanford, Atlantic continued to develop her sailing knowledge and realized that she wanted to start competing again herself. When Nora asked if she would campaign with her, the answer was a no-brainer! Outside of sailing, Atlantic loves traveling, surfing, skiing, camping, and woodworking.